Google Home Hub hands-on review hands on review | What Hi-Fi? Google’s recent press event saw the launch of a couple of new Pixel 3 phones, a Pixel Slate tablet and a new Chromecast, but arguably the most interesting new arrival was the Google Home Hub. Crudely put, the Google Home Hub is a 7in touchscreen stuck onto a smart speaker. But in true Google fashion, the Home Hub looks nicely finished, not to mention quite dinky and, dare we say it, quite cute. The speaker shares some design cues with other Google products, including the soft rounded edges of the Pixel phones, and custom fabrics of the Google Home. The material feels robust, yet relatively smooth to the touch and the speaker comes in four different finishes: Aqua, Charcoal, Sand and Chalk. The 16x9 display measures 7in diagonally and boasts a resolution of 1024 x 600. On the back of the screen is a slim volume rocker, and there's a mute switch on top. The display gives the impression it's floating on top of the speaker section, which is a forward-firing full range driver, as well as a pair of mics for picking up your voice commands. Swipe your finger down from the top of the screen and you’re greeted with Home View, your main home screen, adorned with Google-ised icons and fonts. It’s an attractive-looking menu system which is clear and easy to read. Google claims you can control over 200 million different products from Home View, from Nest smart home devices to Philips Hue light bulbs. 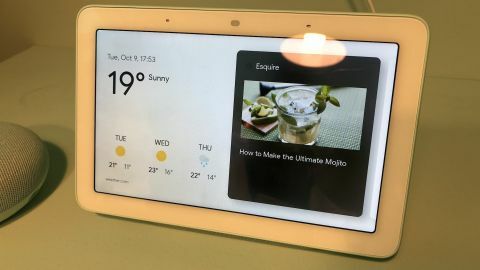 For the Home Hub, Google’s redesigned its Search, YouTube, Maps, Calendar and Photos features, which should make it easier for your commands to register and for the speaker to carry out your bidding. If you just want to use the Home Hub as a wireless speaker you can do with the help of its Bluetooth 5 functionality. During our brief demo, the speaker responded relatively quickly prompts and didn’t get too confused despite having to deal with a level of background noise more akin to a football match. The Home Hub was asked to search the local area for coffee shops and then told to beam the directions to a Pixel 3 being used by one of the Google employees manning the stand - and it worked seamlessly. There’s no camera on the device, which Google says is a conscious privacy-led decision. Instead, where you’d normally find a camera right in the middle of the top bezel, there’s the Home Hub’s Ambient EQ sensor. The aim of the sensor is to stop the display from appearing too bright as the ambient lighting in your room changes - the last thing you want is a glowing smart speaker distracting you in a darkened room. The display can also double up as a photo frame using its implementation of Google Photos to display your snaps. It can be customised to only show pictures with certain people in them and Google claims the Home Hub is smart enough to be able to automatically filter out photos of questionable quality. It's clear Google’s going big on the personalised experience you can get with the Home Hub. We were showed a demo of the speaker’s good morning routine, where the speaker wakes you before proceeding to read out the weather, a travel report (including directions), and your calendar appointments for that day. We were only played a very brief audio clip from YouTube and the Home Hub did struggle to be heard over the hustle and bustle in the background. You got the impression in a quieter environment it’s probably going to be fine playing in the background or serving up the odd music track or perhaps an instruction video in the kitchen. For extended music playback, we're not so sure. But that's not the main aim here. As with all the devices launched at the Pixel event, the Home Hub comes with a free six-month subscription to YouTube Premium, which also includes Google’s YouTube Music streaming service as part of the package. Ask the Home Hub to “play something new” and the speaker will serve up a track it thinks you’ll like. This is a similar approach to that taken by the Apple HomePod, but obviously we’d need more time with the speaker to see just how successfully it matches recommendations to your tastes. We saw a couple of short YouTube videos and the screen appeared perfectly watchable up close, with a decent enough colour balance and enough detail to the on-screen action. These kind of devices aren’t really designed for a Lord of the Rings movie marathon but the occasional clip shouldn't be a problem. The Google Home Hub undoubtedly fills a gap in the Google Home family of wireless speakers and if you're a fan of its previous models, there's a good chance the new model will have similar appeal. But are the picture quality and sound quality up to scratch? Our first impressions are that the Home Hub will be competitive with products around it, but it will live or die on the effectiveness of its Google Assistant skills and how well it integrates with other smart devices in your home. We look forward to testing that out in an in-depth full review very soon.